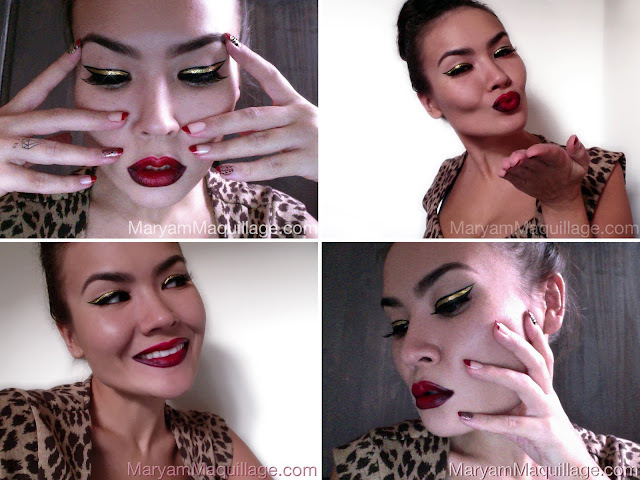 Maryam Maquillage: Wild Wild Xmas! 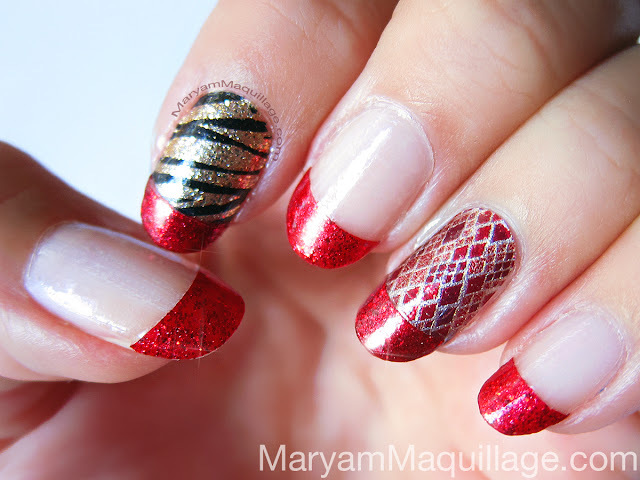 At first glance, this red and gold number looks like a complicated nail art that took an hour to complete. In fact, this ferocious mani is one of the easiest and quickest nail designs out there and took under 10 minutes to apply, using real nail polish appliqués from Incoco. These gorgeous polish strips last up to 14 days, adhere like a dream and contain a base, color (or design) and top coat in each strip. Incoco Ruby Shoes Tips from the current Holiday Collection. 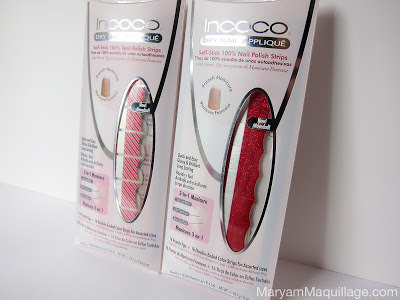 These sparkling ruby red glitter tips can be applied over the bare nail or any other Incoco polish strip. The set comes with 16 glitter tips and 2 sheets of double-ended clear strips to seal in the mani. Incoco Cobra Couture from the Fall Collection (ring finger nail) -- this geometric shimmery snakeskin pattern is perfect against Ruby Shoes Tips or can be worn alone to give your fingertips a dose of animalistic edge! Incoco Prima Donna from the Drama Queen Collection (pointer finger nail) is wild and dramatic as the name suggests. The glitter zebra print design is bold and bright, perfect for any party, especially New Years Eve. Paint a thick line starting from the inner corner using Rhyme (Gold). Allow for the liner to dry, and line again if necessary. Using a black liner (Quill), paint a thin line staying close to the lashes. Wing out the line to outline the outer edge of the gold liner. Paint a thin black line above the gold liner to create a border. Fix any mistakes or unevenness using the gold liner. 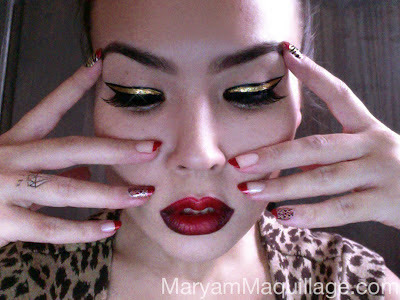 Add a touch of gold glitter to the center of the gold liner and complete the look with spiky false lashes. 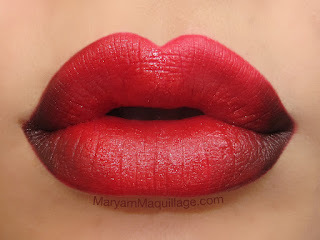 Line your lips using a sharp red lip liner and fill in the lips. Using a lip brush, apply red lipstick all over the lips, blot, then reapply the lipstick and blot again. Your perfect red lip is complete! To take this red lip to an edgy ombré lip, use a warm dark brown lip liner to line and fill in the outer corners of the mouth. Blend the product inwards using a lip brush. Notice that this step makes the lips look plumper. This is a great tip for longer, thinner lips. Add fine loose glitter on top of the brown liner to give the ombré look a dose of holiday glam. Be the Wildest Belle of the Ball! Love love love, the nails are my favourite! I love your nails. Gorgeous photos. your nails look oober cool!! This is amazing! I will have to try the eyes, that liner is bomb! I absolutely love this look! I first wanted to say I love the snakeskin nail print, then I wanted to say I love the edgy eye makeup (that eyeliner is amazing!) and then the lips are amazing! I love this look! So perfect for the holidays!! 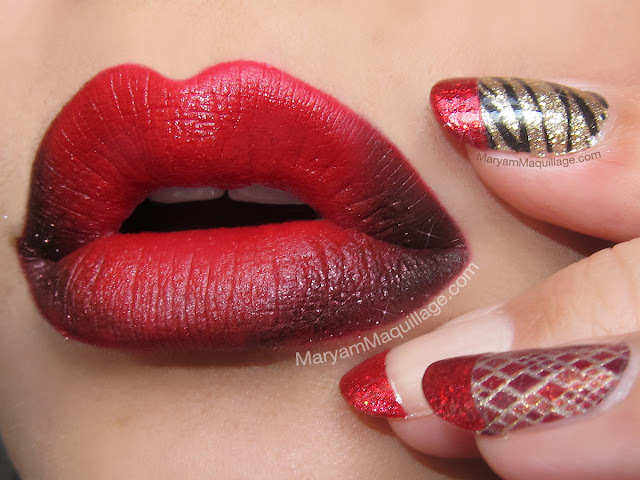 absoloutely GORGEOUUUUUS wow such a fantastic lip and beautifull nails I love them both! Wow my dear Maryam. Never seen such sensuous sensational lips at such a close range.Its almost like reading a map ! Yours are worth a fortune.Ever considered insuring them ? Have a Great Christmas & Very Joyous New Year ! my my my!! this is so beautiful. Wonderful eyes and nails!! Everything in this post is absolutely amazing! You are one talented lady! Love the lips and eyeliner! I thought for sure that you had drawn the nail art yourself, though I'm sure you could!